Eastern medicine believes that pain and stress are caused by stagnation of blood, fluids, and vital energy – Qi. Cupping promotes Qi life energy, helps improve our immune system, increases circulation, helps drain fluids, draws stagnation, pathogenic factors and toxins out of the body and delivers fresh oxygenated blood to help reduce inflammation and expedite healing. 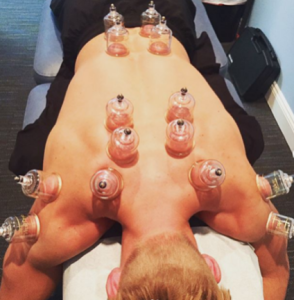 Myofascial cupping is a form of trigger point therapy that helps lift, separate and stretch connective tissue (fascia) to detoxify and nourish soft tissues and improve range of motion. Myofascial cupping works to directly target restricted area by placing cup over the area, creating negative pressure by lifting and stretching the skin to pull fresh oxygenated and nutrient rich blood into the area cupped. This technique can effectively be used to soften scar tissue, adhesions, cellulite and stretch marks. Cupping may be used almost anywhere on the body and depending on the cups and techniques, can reach up to 4” deep inside the tissue producing remarkable therapeutic results. The techniques we may use are called “static” or “dynamic”. Cupping marks or “cup kisses” are not bruises. The discolorations produced after cupping can be a result of buildup of toxins brought to the surface, stagnation, and previous injury or lactic acid produced by the muscles. If redness or itching occurs, it’s likely due to inflammation brought to the surface, which is completely normal. Results can be seen or felt after only a few cupping sessions. Most cases you will start feeling better instantly. With regular use you will experience improved mobility, muscle tension relaxation, increased energy, radiant looking skin, healthier physique, reduced stress and anxiety, better sleep, less pain and discomfort, and increased circulation and so much more!